We create new standards for all of us! Trade at core spreads paying very low or even zero commissions depending on the asset class and order size. Positive slippage is also enabled. Invest in top performing multi-asset strategies with JFD’s next generation mirror trading platform - no set-up or management fees. 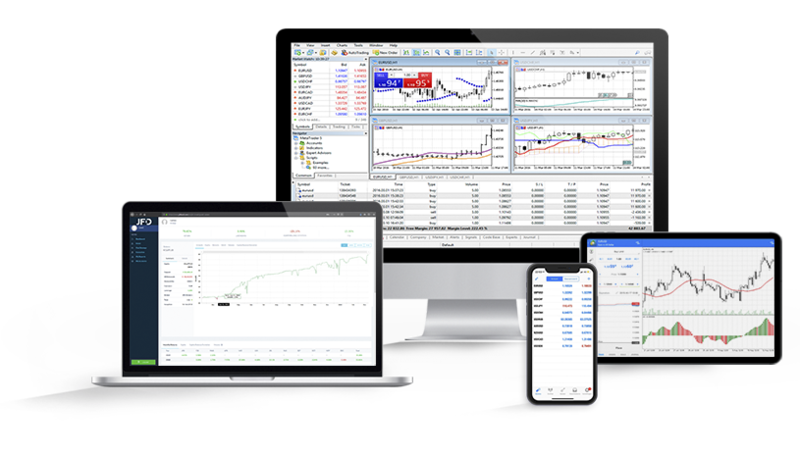 Trade on MT4+, MT5+ (desktop and web) and leading third-party platforms equipped with custom add-ons and indicators. Warning: Please be aware of deceptive websites posing as JFD. To guarantee the safety of your funds and personal information, make sure to use the official JFD website. We are registered and licensed, under strict regulations, authorised to conduct Portfolio Management, Investment Advice and Agency Only execution services. As JFD is a member of The Investor Compensation Fund (ICF), all our clients fall under its protection, and are eligible to be compensated, thus guaranteeing the safety of their funds. Our vision is simple: to deliver better financial services for traders and investors. We have introduced a globally unique transparency standard for retail clients in foreign exchange. We were the first to transform a leading trading platform into a real multi-asset suite. We are on a mission to change the retail financial industry for good. In our opinion, people are the backbone of any business, which is why at JFD each talented team member is responsible for delivering on our promises to you. We take action on our promises to deliver game-changing innovations, gaining global recognition in the process and winning numerous awards for our exceptional contributions to the industry. For providing our sophisticated clients with the most innovative and comprehensive solution suite available in the marketplace, JFD has been already ranked high for Top Execution in Germany and Fastest Growing Financial Services Company in Western Europe. *Performance statistics of the strategies may be provided upon request.